Statue of Nathan Bedford Forrest in Health Sciences Park in Memphis, Tenn.
Memphis, Tenn., city leaders unanimously voted on Tuesday night to exhume the body of Nathan Bedford Forrest, a former Confederate general and Ku Klux Klan leader who is buried in the city’s Health Sciences Park, and move him to a private cemetery, Fusion reports. 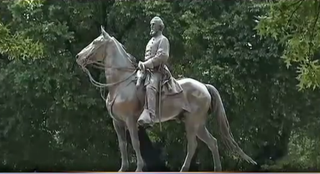 According to the report, the City Council also voted to move his wife’s body from the park and to take down the statue of Forrest sitting on a horse that currently stands in the park. The action is just one of the more recent moves of city and state leaders pushing for the removal of Confederate symbols. On Thursday the South Carolina Legislature officially passed a bill to remove its controversial Confederate battle flag from Statehouse grounds altogether. Disapproval of the battle flag and other Confederate symbols has spiked in recent weeks since the horrific massacre in Charleston, S.C., at the Emanuel African Methodist Episcopal Church that left nine people, including South Carolina state Sen. Clementa Pinckney, dead. The suspect arrested in those murders, Dylann Roof, was seen across social media and in the news posing with the flag. Forrest was a Memphis native who made his wealth in the slave trade and gained name recognition as a general for the Confederate Army. He later became the KKK’s first Grand Wizard in 1868 but eventually withdrew from the notorious hate group. As the news site notes, a Tennessee court and the Tennessee Historical Commission still have to approve the removal of the graves, and not everyone is thrilled with the idea. “I think it’s disgusting that people use the shooting in Charleston and use those victims to forward their own agenda and join this anti-Confederate hysteria that’s going on,” Sons of the Confederate Veterans spokesman Lee Millar told local news station WREG. Read more at Fusion and WREG.